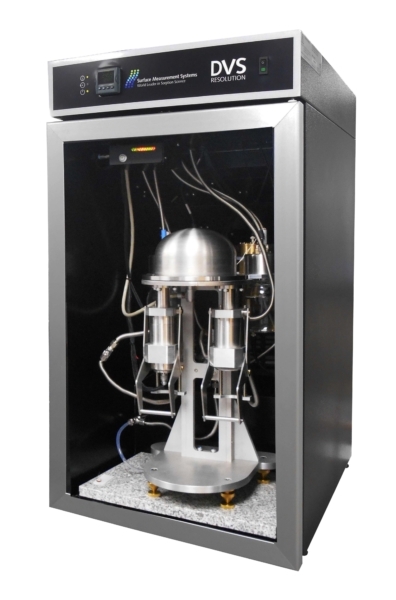 Dynamic Vapor Sorption (DVS) is a gravimetric sorption technique that measures how quickly and how much of a solvent is absorbed by a sample. 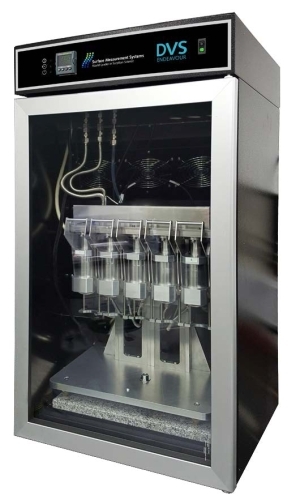 The latest advancement on DVS is its speed of sound sensor which increases the reliability and accuracy of DVS data by providing the only method for directly measuring solvent vapor concentrations. Speed of sound is the only method that directly measure solvent concentrations over a wide range of temperatures and partial pressures. Previous methods for measuring solvent concentrations have either been non-existent or predicted the concentration. Our previous DVS Advantage measured solvent concentration with a calibrated dew-point-analyzer. Customer demand for a universal, accurate measurement technology led Surface Measurement Systems to developed this revolutionary new sensor. The patent-pending sensor measures vapor concentration directly using the speed of sound. This measurement is directly related to temperature, the gas phase species present, and its concentration. This technology allows for closed-loop control by adjusting vapor delivery using real-time measurements. Not only is the SOS measurement fast (1s), it is reliable and a fundamental gas phase property. Our DVS systems based on the speed of sound technology are DVS Resolution and DVS Endeavour. We named our systems after Captain Cooke’s famous ships because of their legacy of discovery. We are certain that our the speed of sound based DVS systems will help you make your own discoveries. Explore more details on the systems below.